I mentioned “windows update” because it has happened to me and my colleagues several times whereby after performing an update to the Windows OS, we got a BSOD (Blue Screen of Death) and just can’t seem to boot into Windows. 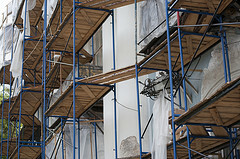 An easy way to fix the problem is to reinstall the OS but may risk losing some files. Anyway, it’s always best to backup files regularly either to an external hard disk or to the cloud (Mozy or Dropbox). Another way is to create an image of your entire PC using software such as Norton Ghost or its free alternatives. Today I would like to highlight a free software called Comodo Time Machine which is capable of helping us restore a computer to an earlier time / snapshot. 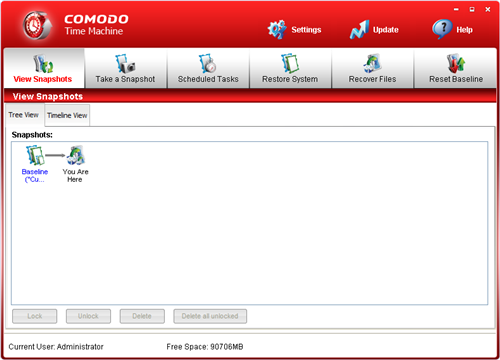 Comodo Time Machine (CTM) is a windows only desktop application which allows you to create snapshots of your PC and provides the ability to restore the machine back to the snapshot version whenever necessary. Tinkering with windows registry via regedit. Trying out new applications which may not be secure / buggy. If at any point my machine fails to work after making any of the above changes, I can simply rollback to the snapshot and restore my machine to the state before the changes were made. But before I proceed walking you through the steps on how I used the app, I think it’s appropriate for me to highlight that there are users who have encountered problems using the software. So before you proceed to install this app, just be aware that the software could potentially break your Windows OS! Ensure to have a backup image of your hard drive before installing. As for myself, I thought I should give this free app a try before jumping into any conclusions about the reliability of the software. For now, I’ll keep the app installed and provide any updates in case it does corrupt my machine. Basically this is how the test went. I installed CTM and upon rebooting, it created a baseline for my machine (Dell Inspiron 1420, Windows Vista). Before I created a snapshot, this is how my desktop looks like. I went ahead to create a snapshot of my machine so that in the future in case anything terrible happens to it, I can rollback my machine to this initial state. 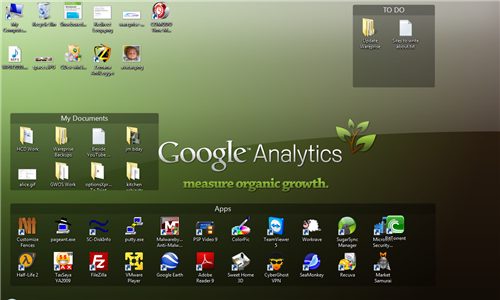 For the sake of testing the app, I altered the contents of my desktop and this is how it looks like. Now to try restoring my machine to an earlier time (before the desktop was altered). 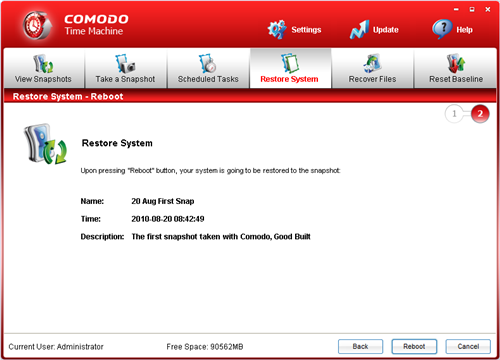 From Comodo Time Machine’s restore system tab, I clicked on the Reboot button and after rebooting, indeed my machine was restored back to its initial snapshot (the screenshot with Google Analytics wallpaper). 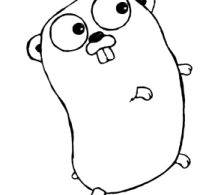 For now, CTM does work on my machine and I’ll keep it on for as long as it works. Since CTM is a free software, I wouldn’t recommend for you to install on a production server with critical files and information in it as there’s no guarantee that support will be provided in case anything nasty occurs (e.g. can’t boot into windows). I guess this app is more suitable for software testers like myself where I occasionally take risks meddling around with the PC settings and configurations and would like to have an ability to quickly revert back to an initial working state. I hope today’s sharing provides you with an alternative method on how to easily restore a PC to an earlier date / time.